It is sad fact of life that deer and gardeners have a love/hate relationship. Moving to larger properties further out from the city of Atlanta is appealing to many urban dwellers but gardening habits may need to be adjusted to account for these destructive characters. 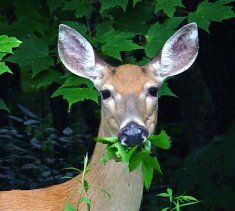 There have been many articles and books written on deer resistance gardening, but the fact remains that deer will eat almost anything if they are hungry, so the only true deer proof garden is one that is surrounded by a high fence or is composed of pure concrete. Assuming that you want more than concrete for a garden, there are options ranging from fencing to plant choices. If your favorite plants are on the deer’s favorite smorgasbord list, such as hostas, then the only option is fencing. This removes all animals from the property too, including some birds, but is well worth the effort if you want a guarantee for a garden. Fences have to be at least ten feet high. This is not pretty, but certain materials on the market today make the exclusion possible while still keeping a view from your porch. The idea of these screen-like materials is to block entry, and it is blended into the surrounding woodland. Most screens are attached to trees or to posts near trees, and this makes the screen almost invisible from the home. Rather like a dog’s invisible fencing though, you need to delineate where the screening goes. Most people place the fencing round the back garden and anchor it to the house, thus making as little impact on curb appeal as possible. Gates for entry are made into the fencing. If you do not want to totally fence the garden, then understanding the deer’s browsing pattern will help. Once a browsing trail has been established, the deer generally keep to it. If you have a favorite shrub that is on that pathway, then you can protect just that one area with a smaller fence that is high enough to prohibit stepping over, but not wide enough to jump into. These fences can be as low as three or four feet, depending on the shrub. Plant choice though can go along way to having a garden and wildlife, including deer. On the most popularly destroyed list are many colorful annuals. A deer can march through these tasty morsels overnight, even if you haven’t put them into the garden yet! Ornamental grasses seem to be on the less noticed list. In general though, trees and shrubs, particularly evergreen shrubs, are less susceptible than annuals and perennials. So this is a good place to start with your deer resistant garden design. Hollies, spruces and yews are all attractive plants that deer rarely bother. On the perennial list are most herbs, as they are scented, thus making them less appealing to the deer population. Herbs such as thyme, rosemary, costmary, hyssop and artemesias may be stomped on to get to a more popular morsel, but they will not usually be eaten. Surrounding vulnerable plants with less attractive plantings has also been known to work for some people. Making sure that your bird feeders are empty each evening will also go a long way to ensuring that the deer have no reason to tarry in your garden. Obviously the amount of deer proofing needed depends on your use of the garden and the plants you want to grow, versus, how much enjoyment you get from seeing deer, particularly fawns, frolic near the house. Good landscape choices may give you the opportunity to do both.